When was the first Christmas card sent? Why do we kiss under the mistletoe? Learn the origins of Christmas and fun facts about some of our favorite christmas traditions and symbols. There are lots of Christmas traditions that are practiced by a number of countries all over the world during the holiday season. These traditions can be as diverse as the culture and religious practices of each and every country in the world. Read about some of the most common christmas traditions here. From the Old English 'Cristes Mæsse' ~ meaning the 'mass of Christ' ~ the story of Christmas begins with the birth of a babe in Bethlehem. And there were in the same country shepherds abiding in the field, keeping watch over their flock by night. And, lo, the angel of the Lord came upon them, and the glory of the Lord shone round about them: and they were sore afraid. And the angel said unto them, "Fear not: for, behold, I bring you good tidings of great joy, which shall be to all people. For unto you is born this day in the city of David a Saviour, which is Christ the Lord. 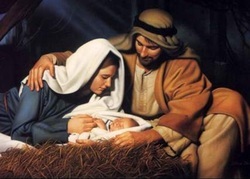 And this shall be a sign unto you; Ye shall find the babe wrapped in swaddling clothes, lying in a manger." And suddenly there was with the angel a multitude of the heavenly host praising God, and saying, "Glory to God in the highest, and on earth peace, good will toward men." In 16th-century Germany fir trees were decorated, both indoors and out, with apples, roses, gilded candies, and colored paper. In the Middle Ages, a popular religous play depicted the story of Adam and Eve's expulsion from the Garden of Eden. The origin of Santa Claus begins in the 4th century with Saint Nicholas, Bishop of Myra, an area in present day Turkey. By all accounts St. Nicholas was a generous man, particularly devoted to children. After his death around 340 A.D. he was buried in Myra, but in 1087 Italian sailors purportedly stole his remains and removed them to Bari, Italy, greatly increasing St. Nicholas' popularity throughout Europe. 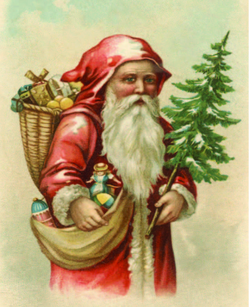 Other countries feature different gift-bearers for the Christmas or Advent season: La Befana in Italy ~ The Three Kings in Spain, Puerto Rico, and Mexico ~ Christkindl or the Christ Child in Switzerland and Austria ~ Father Christmas in England ~ and Pere Noël, Father Christmas or the Christ Child in France. Still, the figure of Santa Claus as a jolly, benevolent, plump man in a red suit described in Moore's poem remains with us today and is recognized by children and adults alike around the world.